Our teachers come from all sorts of backgrounds, but they’re united by a common passion: Sharing the joy of music with children and families in and around Newton. Julia Priest has been teaching Music Together and directing this organization in Newton since 2001. 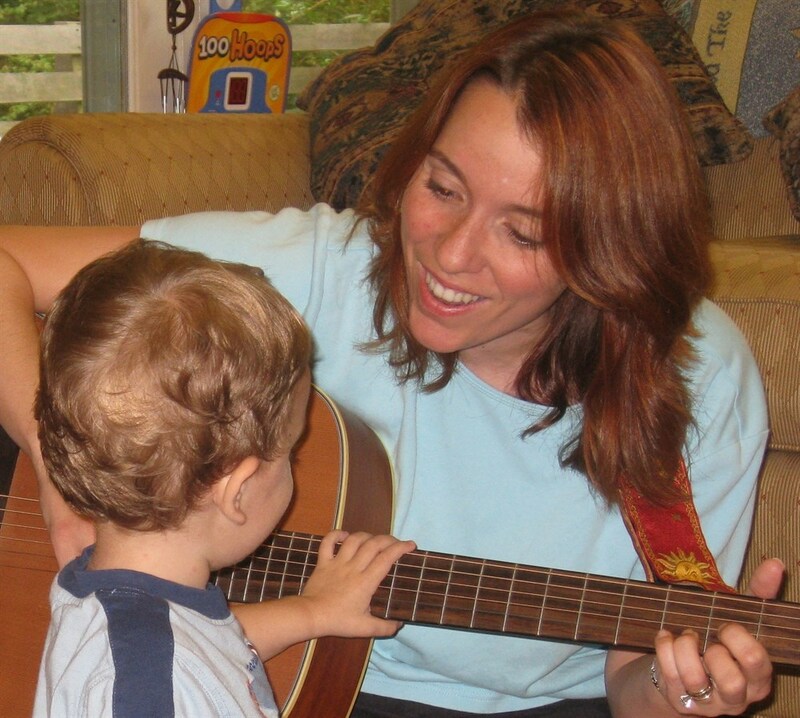 She came to early childhood music and movement teaching through her own son's toddler years when she discovered that the Music Together curriculum was richer and more satisfying than any other mommy-and-me class she could find. She has degrees from Yale, Boston University, and Massachusetts General Hospital Institute of Health Professions, including a Masters of Music and a Masters of Science; she also holds certifications in Dalcroze Eurhythmics, Orff Schulwerk, and Music Together Teaching Mastery, Level II. She trained in the HealthRhythms(R) protocol for therapeutic drumming in 2017 with its founder, Christine Stevens! In class she plays guitar, recorder, or drum; voice is her primary instrument. As Julia keeps on improving her Spanish language proficiency, she also periodically subs for Canta y Baila Conmigo® classes. For fun, Julia knits baby hats and dances Lindy Hop, Blues, Argentine Tango, Salsa, or any other social dance that presents itself. Just ask, she'll teach you to knit or drag you out dancing too. Julia's review of recent research on how babies hear and remember even before birth!. Read more articles and handouts by Julia. Visit Julia's personal website for a list of other performances and jam sessions which are unrelated to Music and Movement of Newton. Maddie Welch plays guitar and piano and sings gorgeously. Born and raised in San Juan, Puerto Rico, Maddie is completely fluent in both Spanish and English. After graduating from Princeton University, Maddie received her Masters in Bilingual Education from Boston University in 1998 and embarked on a career as a bilingual educator at the elementary and early childhood levels. She has always infused her classroom teaching with her passion for the performing arts, from leading school-wide preschool sing-alongs to using drama for teaching content-area to bilingual 3rd graders. Maddie first fell in love with the Music Together curriculum when she brought her daughter to class in 2003. She trained and became a registered Music Together teacher in 2008. When she is not teaching, Maddie is busy raising two musical, bilingual children and working on the latest production of Needham Community Theatre. Maddie teaches both regular Mixed Age Music together and also Canta y Baila Conmigo / Sing and Dance With Me: Spanish Musical Culture, for which Maddie wrote the curriculum and recorded the CD. This class is ideal for families with a Spanish-speaking parent or nanny, or raising a child bilingually. This class is also priceless for those who want to give their family's beginner Spanish-learning career a jumpstart. What families say: "Maddie was fantastic! She made the party a very special event for us! All of the kids had a blast, especially Olivia! We were so thankful to have Maddie there to lead our song & dance!" "It is fun to see around 14 children age 18 months completely absorbed, jumping around for 45 minutes." A.B., Comparative Literature, Princeton University. M.Ed., Bilingual Education, Boston University. Certification, Commonweath of Massachusetts, Elementary (1-6); Early Childhood (PrK-2); Transitional Bilingual Education; English as a Second Language (PreK-9). California-born Barbara de Freitas grew up in Rio de Janeiro with her Brazilian family. Music has always been part of her life: singing in the school choir and spending long afternoons sitting at the piano with her grandfather. She started her music studies at Antonio Adolfo Music School in Rio, taking guitar and voice lessons. Her love of music led her to the USA in 2000 where she formally started her studies at the Santa Barbara College. In 2004 Barbara relocated to Boston to attend Berklee College of Music, earning her Bachelor’s in 2007. During her years in Boston she has been a vocalist in an acoustic ensemble playing Brazilian music around New England, including rhythms like Bossa Nova and Samba. Barbara has also taught voice and basic keyboard lessons to children. In her free time she loves to be involved in athletic activities such as long runs by the Charles, spinning rides, yoga, and dancing, but also singing and relaxing along with good friends. "I would describe my teaching style as fun, caring, and flexible, with attention to the ever-changing needs of children and their families. I encourage participants to express their feelings in the form of music and movement. I believe that in a classroom we are all learning together as we share our experiences: children, parents, caregivers, and teachers, too. I began my music career as a singer. As a Music Together teacher I am able to sing and share my love for music with children every day and watch them expand their creativity, social skills, sense of self, sense of time and space, and even their intuition. Teaching early childhood music is a delight!" Madeleine was raised in a musical family and her earliest memories include singing along at age three with her father’s jazz band in the living room. By age seven, her favorite pastime was writing songs and constructing her own “album covers” out of paper plates. In her twenties Madeleine formed her own band “The Rhythm Hounds," and shortly thereafter, she was nominated for a Boston Music Award. She performed her bluesy brand of R&B in nightclubs and private functions for years, shifting her emphasis towards children’s music with the birth of her daughter in 2001. Since then, Madeleine has been featured in the Boston Arts Festival, as well as at the Boston Children’s Museum. In the Reading Readiness Program of the Boston Public LIbrary, Madeleine regularly performs songs, reads stories, and creates early literacy-based music and movement experiences for children aged 3-5. Madeleine has a degree in Early Childhood Education and is a certified preschool teacher as well as a parent coach. She won the "Love of Poetry" award in elementary school, and her five-year-old tells her she is the funniest person he knows. She is thrilled to be part of the Music Together team! Rosa Elena and Madeleine are so excited to be co-teaching Sunday classes this spring, 2019! We are a teaching and learning community; we draw inspiration from each other both musically and pedagogically. Rosa Elena studied at the National Autonomous University of Mexico (UNAM) in the National School of Music. She came to New England in 2000 and graduated from New England Conservatory with both a Masters in Vocal Performance and a Masters in Vocal Pedagogy (Music in Education concentration). She has Kodaly level II certification in addition to her Music Together training. She has taught large and small groups of children of different needs for ten and half years in both private and public schools. In another part of her life she makes and professionally shows fiber artworks! Rosa Elena says, "Teaching music to young children is my passion and I love to share my culture through music and song. Since my own early childhood I have loved to sing, along with my very musical family. I am so excited to be teaching Music Together and to be meeting you and your children!" All our Music Together teachers are trained by Music Together, LLC. Our Canta y Baila Conmigo teachers are trained by Maddie Welch herself. All of our teachers are fabulous musicians and educators. We love to take each other's classes and we sub for each other when necessary. Demo classes are sometimes team-taught by two or even three teachers. It's a great chance for us to make music together with each other. . . which is what we love best!